You are here: Home / artist to artist / How Does Place Impact Your Art? How Does Place Impact Your Art? Place is a key element of any work of art, but how it shapes, transforms, or (as the case may be) becomes the work depends on the intentions and explorations of the artist. For instance, in Elizabeth Graver’s new novel The End of the Point, place “is a kind of central character – the rocks, the paths, the land in nature and outside of it. People… beg, borrow, steal, gift, set ablaze, mythologize, tear down, reject and love their rocky, windswept little jut of land.” Read more. We asked artists in other disciplines: How does place impact your art? My photographs are directly impacted by place, as I concentrate on domestic interiors. I am most drawn to places that seem quite familiar but are also strange, humorous, and telling in some particular way. For me, our spaces, the choices of what we display and what we don’t, can reveal both our desires and shortcomings. For example, recently I’ve been looking at how we decorate with patterns and representations of nature just as we also wall ourselves off and require protection from the elements and outside world. These bits of character that can be inferred from the place lead me to imagine the inhabitants and dramas that may have played out there. When I was in junior high, a traveling production of Spoon River Anthology played in our small town in eastern Iowa. Edgar Lee Masters’ play is a series of free verse poems spoken by residents of a fictional Midwestern town – one much like my own. The poems probe into place at a granular level but still convey a collective experience. Other works come to mind – Thornton Wilder’s Our Town and Sherwood Anderson’s Winesburg, Ohio. I think Spoon River Anthology affected me so deeply because it helped an awkward adolescent process a tenuous relationship with his own town. Among my most profound life experiences have been the moments when I’ve experienced a deep feeling of community. I wondered if that feeling could be portrayed on screen in non-fiction form. When I started work on Scenes from a Parish, I intended to make an egalitarian film composed of many small narratives, with not one greater than the others. Place would be the film’s central character. I held onto the idea. So many years later, I was still searching for community, this time in a struggling Catholic parish in Lawrence, Massachusetts. Place, specifically the city of Tokyo, was a major force in shaping my screenplay Summation. While it is admittedly clean, safe, vital, and cosmopolitan on many levels, Tokyo is also remarkable for something else: its clockwork. Tokyo is a machine, not unlike the omnipresent “combine” described so eloquently by Ken Kesey in his classic, One Flew over the Cuckoo’s Nest. Whereas most metropolises thrive day and night in an endless, furious, pulse-like fashion, Tokyo is the definition of controlled chaos. Every train, bus, school, workplace, meal, and entertainment venue operates accordingly, unflinchingly spinning themselves according to the dictates of time, ceremony, rules, and order. It is the most comforting and infuriating scenario imaginable, depending on one’s perspective. Thus the characters of Summation exist within the confines of such a metropolis. There is a compartmentalization of their lives that suffocates, frustrates, as well as activates their choices and their subsequent need to find freedom and closure to their respective dilemmas. How does place factor into your own work? Share a comment and join the conversation. Sarah Malakoff‘s work is currently featured in Suburbia, an exhibition at Hagedorn Foundation Gallery in Atlanta, GA (thru 3/16). Steven J. Martin is screenwriter and an experienced language, literature, and writing teacher in both the U.S. and Japan. James Rutenbeck‘s film Scenes from a Parish screens at MIT as part of the Urban Film Series (4/4, 7 PM). 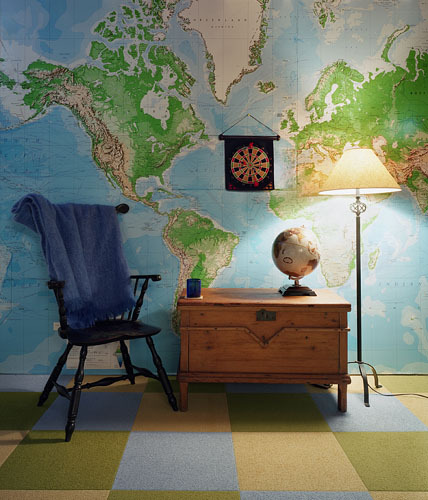 Image: Sarah Malakoff, UNTITLED INTERIOR (WORLD), 2010, Digital C print, 32×40 in.